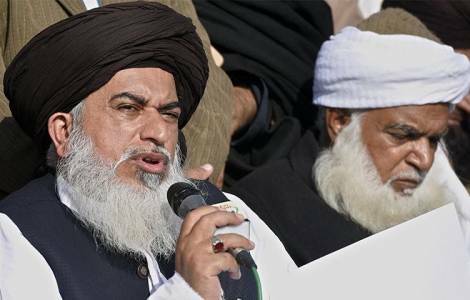 Islamabad (Agenzia Fides) - Police in Pakistan have arrested Khadim Hussain Rizvi, leader of the Islamic radical Tehreek-e-Labbaik Pakistan party (TLP) who organized the violent protest, which paralyzed the nation, in the aftermath of Asia Bibi’s acquittal, a Christian woman who had been condemned to death for alleged blasphemy. Rizvi had announced a new wave of protest on November 25 to "pay tribute to the martyrs of his party". Commenting on the arrest, Federal Minister for Information Chaudry Fawad Hussain said: "Maintaining public order in the country is the responsibility of the state, and we will not allow anyone to destroy it". Khadim Hussain Rizvi had publicly threatened and issued a fatwa (religious decree) against the magistrates of the Supreme Court who acquitted Asia Bibi. "Asia Bibi was falsely accused. The state is responsible for safeguarding the lives of citizens. Asia Bibi’s case should not have lasted that long. It is the duty of the state to assure them of complete protection", said Saqib Nisar, President of the Supreme Court of Pakistan, senior magistrate who presided over the panel of judges who acquitted Asia Bibi on October 31. The judge addressed the members of the British Parliament, during a recent visit to London with these words: "Each judicial case is independent: there is no high profile or low profile case. In Pakistan, judicial reform has the highest priority: measures are needed to reduce delays in dealing out justice", adding that "corruption is one of the most important problems". The examination of the case of Asia Bibi in court was delayed several times due to pressure from Islamic militant groups. The judges, in trials at three levels of judgment, received threats and some of them refused to fix a date for the hearing. Sabir Michael, a Catholic human rights activist, told Agenzia Fides: "We appreciate the efforts of the President of the Supreme Court in the case of Asia Bibi: Nisar hopes that there will be no delay and that justice is administered promptly. The delay in justice is the death of justice. The rule of law must prevail over every fundamentalist group and over its pressures". Asia Bibi, acquitted on 31 October, is now in Pakistan in a safe place by order of the Supreme Court. Her release created a tense situation across the country. - eyewitnesses reported that 1,000 villagers were present at the public assembly, held in the presence of local imams, to indict Asia Bibi; others speak of 100 people, referring to another place: there are also conflicting versions on the duration of this assembly.